Clove trees are naturally found in Indonesia and will grow in the tropical climates of India, Hawaii, Brazil, Jamaica and other areas. The spice clove is the immature, unpollinated flower bud of the clove tree and cannot be used to grow a clove seedling. Finding a clove tree to buy can be difficult and expensive, but through the Internet you can purchase clove seeds that will germinate and grow. It will be five to seven years before your clove tree will bear flowers you can use as a spice. Buy pollinated clove seeds from a reputable source. Be sure the seeds are recently gathered and not dried out, because dried clove seeds will not germinate. You will need to plant your clove seeds as soon as you receive them for successful germination. Fill your pot or planter with rich, loamy potting soil that drains well, such as one used for orchids. 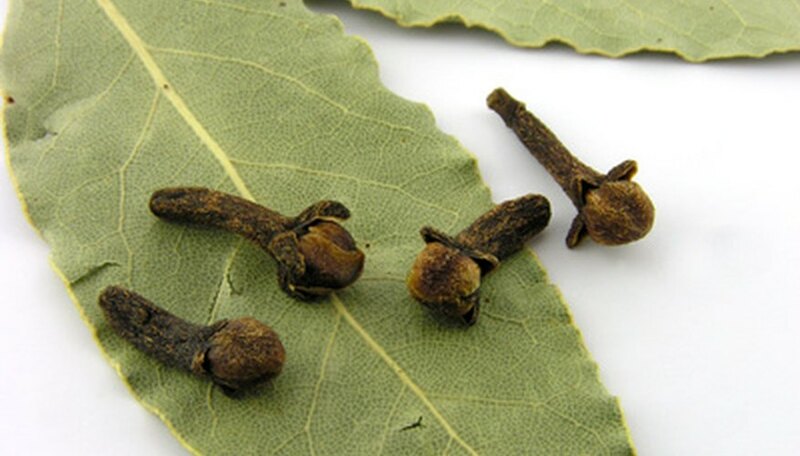 Clove trees like to grow in moist soil, but cannot tolerate wet, soggy soil. Add water to the soil so it is moist before planting the clove seeds. Place your clove seed on the soil surface, as it would be in nature. Your clove seeds do not need to be covered with soil to germinate. If, when the seeds arrive, any clove seed has already developed a root, gently plant the root into the soil. Cover your clove seed with an inverted clear plastic cup. Clove trees are tropical and thrive in humid conditions, so a clear plastic cup gives the clove seed a more humid environment. Keep the soil moist, not soggy, during germination. Place your planted clove seeds in a bright spot with a temperature range of 65 to 80 degrees Fahrenheit. Although clove trees prefer sunny locations, avoid direct sunlight as your seed is germinating. Watch for your clove seeds to begin sprouting in two to three weeks, but do not be discouraged if it takes over a month before you see your seeds sprout. The seeds will be developing roots before sprouting. Transplant your clove seedlings when they are 1 inch high into a larger pot. The root system of clove seedlings is quite fragile. It will be less damaging to the roots to transplant them at this stage than when they are bigger. Fertilize your clove tree in the spring and again in the fall using an organic fertilizer that contains natural organic matter and decomposed manure. Follow the instructions on the package.